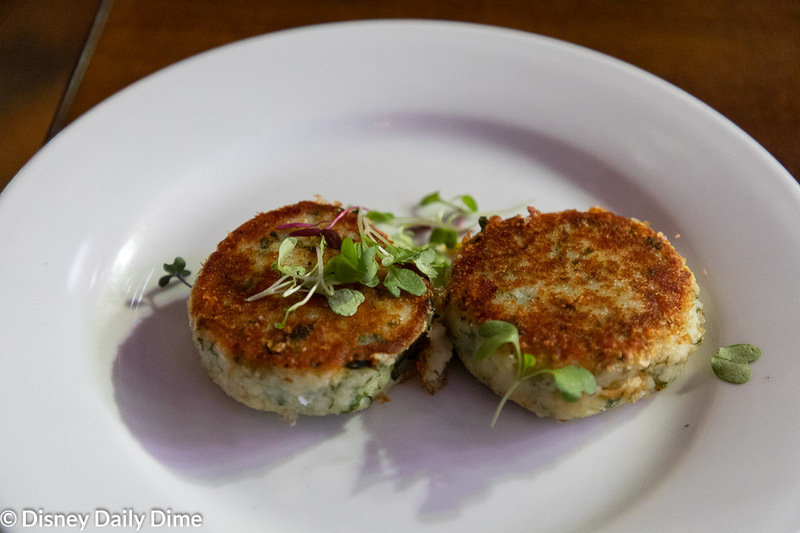 From a value perspective, most entrees for the Raglan Roach brunch are in the $15-25 range. For that reason, it probably isn’t your best value for the dining plan as it does require one table service credit. In most instances, it probably makes sense to pay out of pocket for this meal. So back to my comment about this place being authentic down to its bones. I mean that. 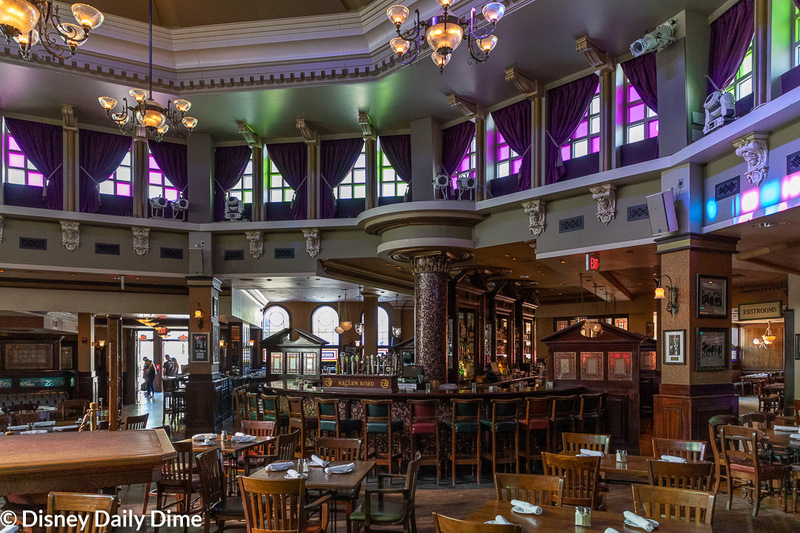 The entire building was completely built in Ireland, then dismantled and transported to its current home in Disney Springs. I can only imagine the logistical challenges that endeavor presented. I’d say leave it to an imagineer to figure out, but Raglan Road isn’t actually a Disney owned restaurant. 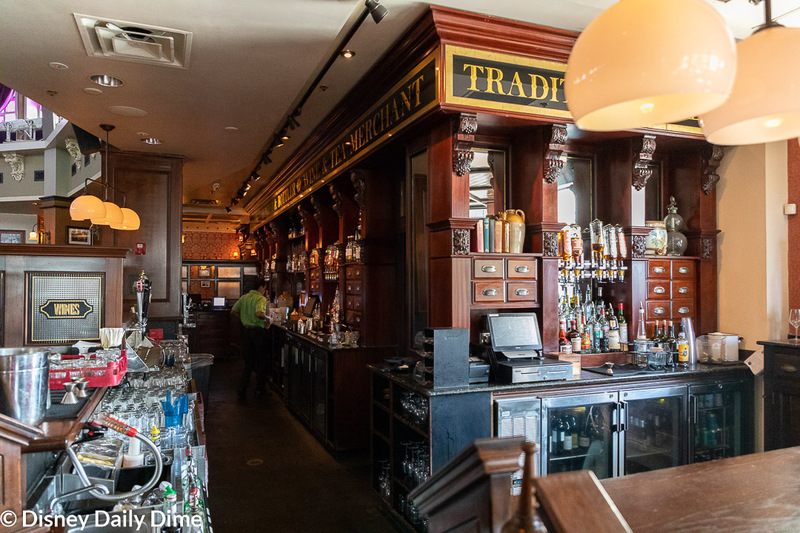 We had the opportunity to talk with the manager the morning we dined here and he filled us in on many of the very Irish traits of Raglan Road. I especially like his story of the old preacher’s pulpit that sits in the middle of the main dining room. This is one of the many places where some of the Irish dancers will entertain guests. As you dine here make sure you take it all in. 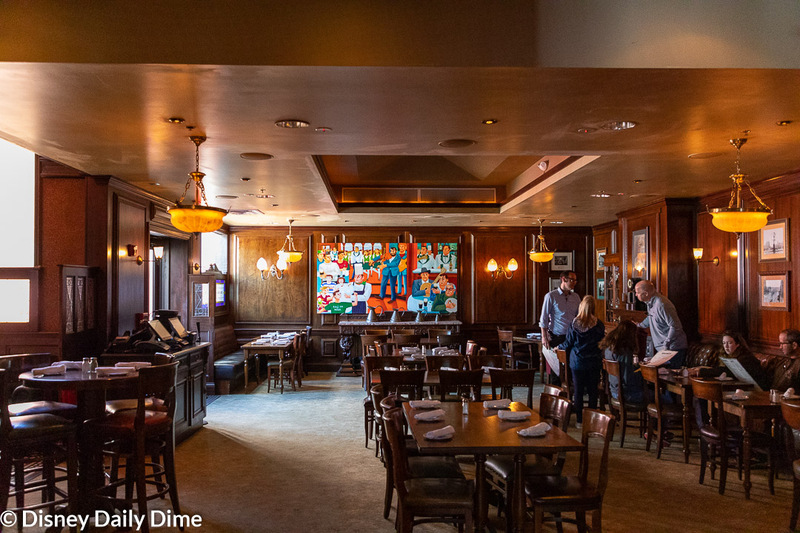 From wood paneling that was reclaimed from Victorian-era Irish homes to a bar that was salvaged from the remains of a Dublin apothecary shop, this place is Irish to the core. 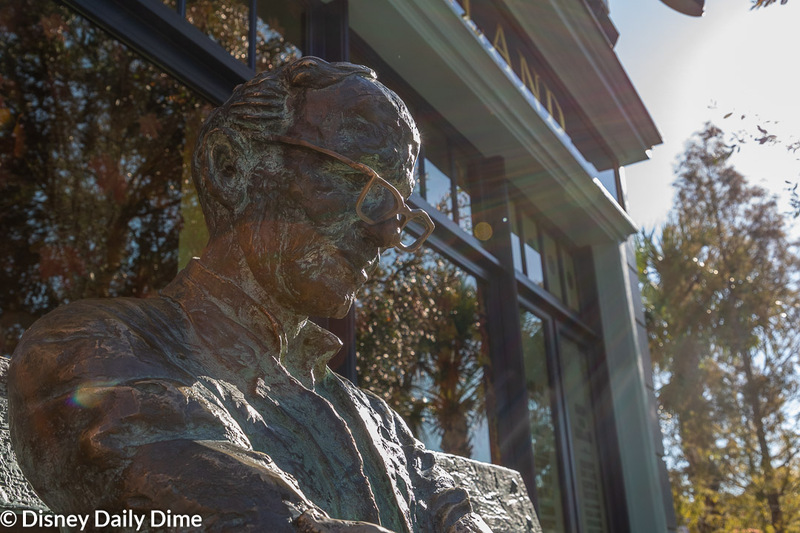 Outside of the restaurant sits a sculpture of Irish poet Patrick Kavanagh. You can take a seat with him and enjoy some along time in though before you head in for your brunch. Just don’t sit on his hat. The sculpture is a replica of an original that resides along the Grand Canal in Dublin. But the Irish feel doesn’t stop with the building. It extends to the staff and entertainers. Many of them are here directly from Ireland too. Cooks, dancers, musicians, managers, you name it. Having people native to Ireland lends authenticity to the Raglan Road brunch menu. As the manager described it, these are dishes “I’d eat at home”. 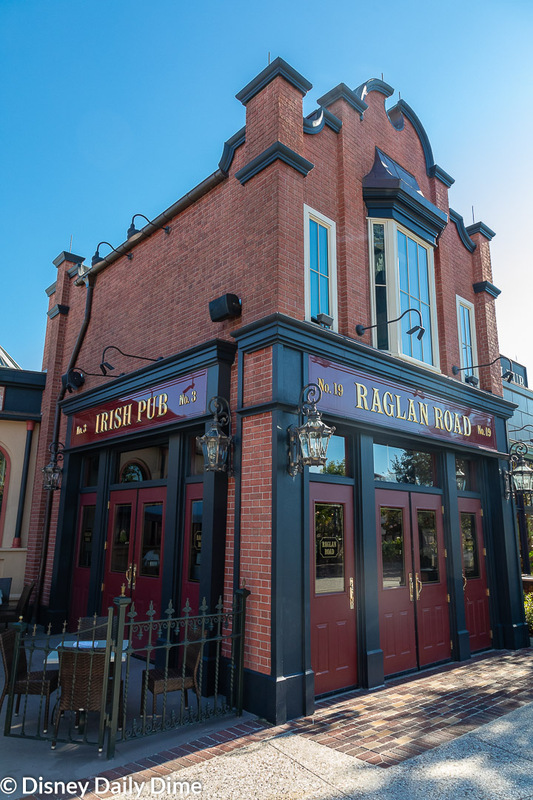 Heck, even the owners of Raglan Road are Irish. Clearly, authenticity is important to them and we think it pays huge dividends. So, if we had one failure in planning our Raglan Road brunch review it would be the timing of it. We ate here on the last day of a trip before rushing off to the airport. Because of that, we had a reservation for right at 9:00 AM. Unfortunately, that meant that we didn’t get to see any of the entertainment that goes along with brunch because the Raglan Road brunch entertainment doesn’t start until noon. A reason to come back, I suppose! We can tell you that you’ll find entertainment put on by the Raglan Road Dancers. From what we’ve seen and read, the entertainment isn’t a full on evening bar type party, but it will get loud in here. While we didn’t have Anna and Elsa with us on this trip, we will say having the peace and quiet to sit and talk was nice. We’d be concerned how they would handle the music and entertainment, because Anna is very sensitive to loud noises. If you have kids that are sensitive to noise, I’d recommend bringing kids to brunch early. The entertainers will put on a variety of performances showcasing traditional Irish dance and music. There’s a main stage area at the back of the dining area and as we mentioned earlier, the preacher’s pulpit in the middle of the main dining room. Ask for a seat near the pulpit, if you can. We think it would be real fun to see the entertainers there up close. If you want to have brunch here, but not be as close to the entertainment, there are a couple of smaller dining areas that are away from the main stage. Ask to be seated in one of them and it will help keep the noise down. I won’t say it will eliminate it because it is just an open area. But at least the speakers won’t be blasting down on top of you. 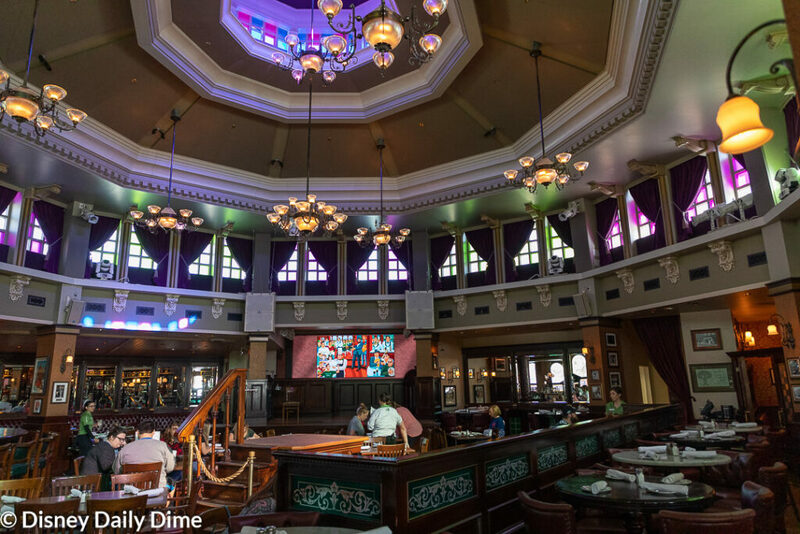 The Raglan Road Bruch Food Carries Over the Real Irish Feel…Because it is! As part of the Raglan Road brunch you get what else but bread service to start! I feel like we had bread on our mind when planning this trip given the fabulous bread service we had at Sanaa, followed by this. 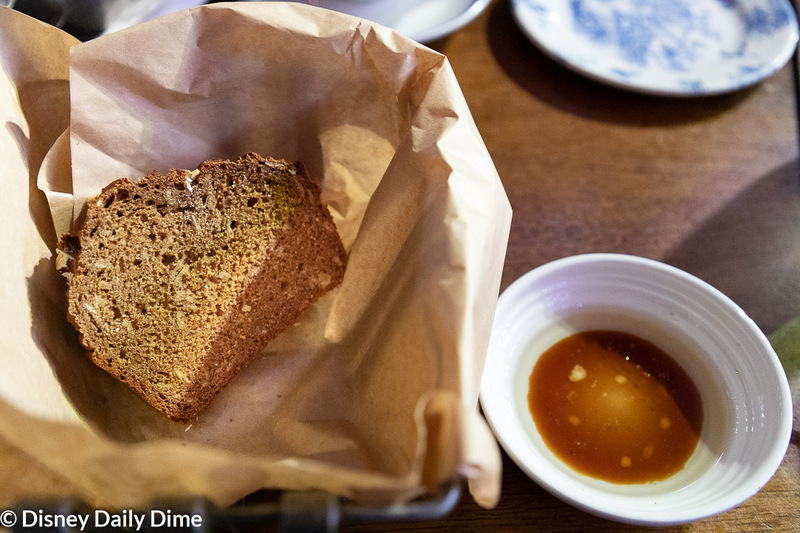 Now the bread at Raglan Road isn’t your typical bread. Oh no, this is an authentic Irish Soda bread. I have to say, I was a little apprehensive when it landed on the table because I’m not generally a big fan of darker grain breads. Fortunately, after one bite, my fears were assuaged. The soda bread was fantastic! Combine it will the Guinness reduction dipping sauce and I ate the whole thing. Sadly, Carla couldn’t have any because it is not gluten free. More for me! For the entrée, I had a really hard time deciding what to have. Between the really fun names for the food and how great many of the dishes sounded, it was a tough call. Ultimately, I ordered the Salmon Prone to Waffling dish. Like I said, lots of fun names. You really should give the menu I linked to a once over just to read the names. If you read the name, you might correctly surmise that the dish is basically salmon and waffles. You would be correct, but that doesn’t do justice to how great this meal was. Let’s start with the salmon. It wasn’t just plain old grilled salmon. They took the grilled salmon and topped it with smoked salmon. This was phenomenal! The smokiness of the smoked salmon, with a nice crust of salt was a great compliment to the grilled salmon. 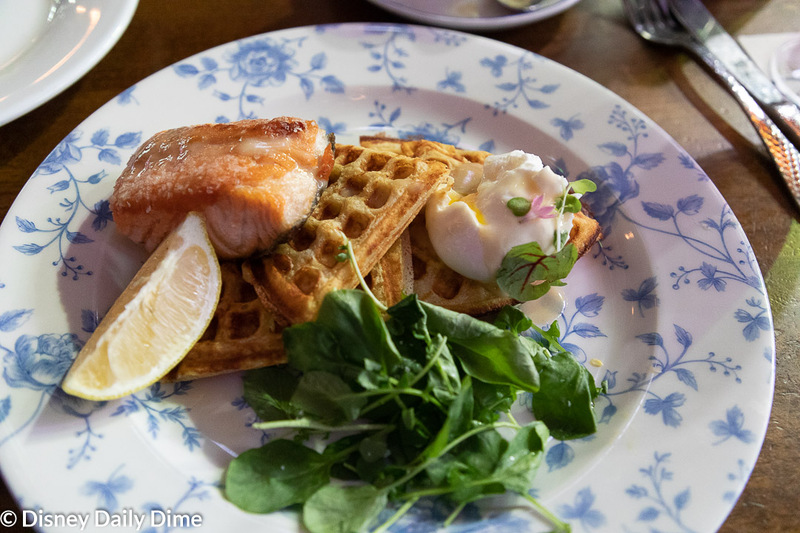 Pairing the salmon with the waffles makes for a near perfect sweet and salty combination. The only reason I say near perfect is that there were a couple of bites of the salmon where it was actually too salty. That’s saying something because I like salt. But it was only a couple of bites. Beyond that, it was perfection. I will say that I really enjoy smoked foods. If you do, this will probably be an excelled dish for you. As you can see in the picture the Salmon Prone to Waffling is served with a poached egg. I’d say the egg was good, but nothing overly notable. Pairing it with the waffle worked well too. In addition to my meal, I ordered a side of potato cakes. I was looking for something that would be hash brown like in an Irish food context and this was the best I could find. Unfortunately, I did not enjoy the potato cakes. The cakes had this nice and crispy outside, but I found the inside of them to be very mushy. The flavor was just okay, but the interior texture is what really put me off. For Carla’s brunch meal at Raglan Road, she was in hog heaven. Or maybe I should say fish heaven. She’s a long-time lover of fish and chips, but rarely gets to have it as she eats gluten free now. Sadly, most places don’t have gluten free breading for the fish. Fortunately for her, Raglan Road does have a gluten free fish and chips! She loved the crunchy batter, tender and flaky fish, and the crisp chips on the side. 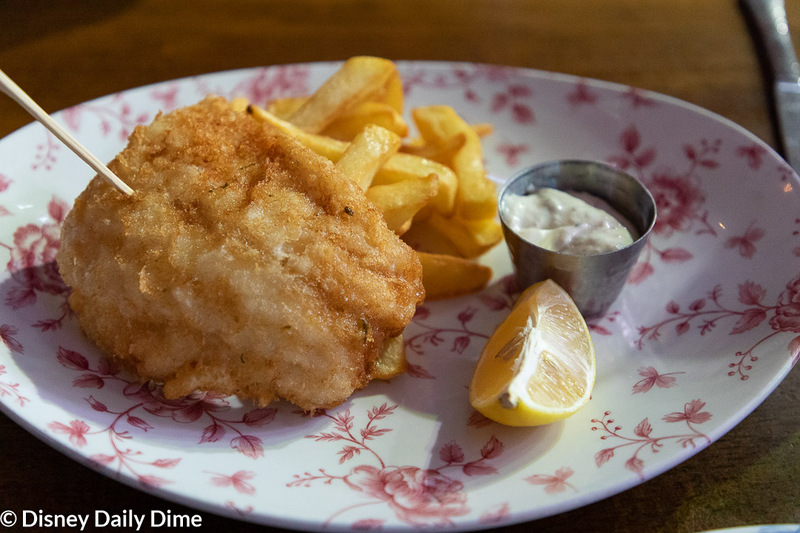 She highly recommends this dish for anyone who is gluten free and loves fish and chips. Now someone just needs to make gluten free malt vinegar to go with the fish and chips and she will really be happy. One note on ordering gluten free at Raglan Road brunch. There isn’t a dedicated gluten free menu here. Your server will walk you through the gluten free brunch options. Carla found our server very knowledgeable about what items on the menu can be made gluten free. As we said earlier, this isn’t a Disney owned restaurant, so they don’t follow the exact same protocol. The food at Raglan Road was excellent. Between the food, great service, and very cool Irish atmosphere this is a meal we will definitely be revisiting. The next time we’ll make sure we actually make a reservation for a time when we can see the entertainment! We assume it will make the experience that much better! With that, we’ll wrap up our Raglan Roach brunch review. If you’re looking for something very authentic that you probably can’t do most places in the United States, this is a place for you to check out. 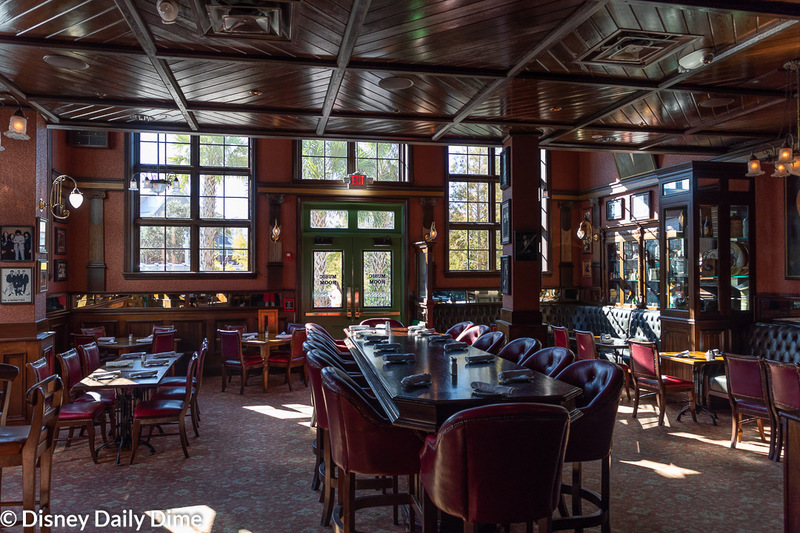 If our Raglan Road brunch review was helpful, or at least entertaining, please like and share it with your friends or anyone you think will find it useful. Just use the sharing buttons on the page. We always appreciate it when you share our posts, as it allows us to spread the word about our young blog and hopefully allows us to help others. I’m not sure word can ever express how appreciative we are!